Today is Michaelmas Day; the feast day of Saint Michael and All Angels. For many of us the significance of this date will most probably have faded into the mist of times past, but there are ancient customs, traditions, festivals and folklore surrounding it that I find fascinating. 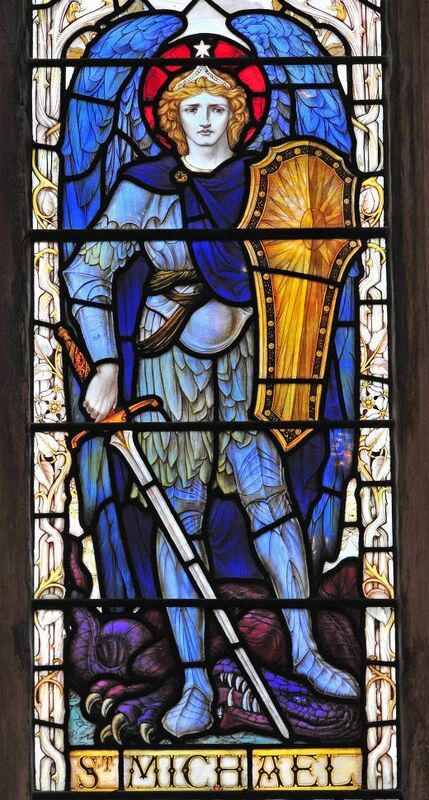 The Archangel St. Michael is the patron saint of the warrior, who Catholics have designated as the protector of those who strive to preserve security, safety and peace. In the British Isles the harvest season used to begin on the first day of August, which was called Lammas, meaning ‘loaf Mass’. Farmers made loaves of bread made from the first of their new wheat crop which they then gave to their local church. This custom ended when Henry V111 broke away from the Catholic Church and instead it became tradition to hold Harvest Festivals at the end of the season close to Michaelmas Day, which traditionally marked the last day of the harvest season. Michaelmas Day is one of the four “Quarter Days” of the year. They are spaced three months apart on religious festivals close to the solstices or equinoxes: Lady Day is the first on 25th March, then Midsummer on 24th June, Michaelmas is on September 29th and the final one is Christmas on 25th December. These four dates marked the days on which rents were due and bills had to be paid up. Michaelmas, or Goose Fairs were ‘Hiring Fairs’, attended by both those seeking employment and to hire new staff. On the day after Michaelmas every year, agricultural labourers presented themselves, along with their tools, at the nearest market townto offer themselves for hire for the coming year. Here too Geese were brought to market for sale and tenants seeking a delay of payment traditionally bought a goose as a present for their landlord to help seek his indulgence. “Eat a goose on Michaelmas Day, Want not for money all the year”. “He who eats goose on Michaelmas day shan’t money lack for debts to pay”. Goose Fairs are still held in some English towns, but geese are no longer sold. The most famous Michaelmas fair is the Nottingham Goose Fair which was originally held in September on St Matthew’s Day, but moved to early October in 1752. The Goose Fair goes back so far in history that no one knows for sure how it got its name, but it’s probably from the hundreds of geese which were driven there from all over Lincolnshire to be sold in Nottingham. Most historians agree the fair probably started just after 1284 when the Charter of King Edward I referred to city fairs in Nottingham. Goose Fair started as a trade event, although nowadays it is better known for its fairground rides and games. This particular piece of folklore certainly persisted into my Northamptonshire 1950s-60s childhood, when we were warned by my mother to be sure not to pick or eat blackberries after the end of September as “the Devil spits on them”. I wouldn’t have dared risk it and I’ve told my children the same thing! I do hope they remember and pass it on. I must remember to tell the grandchildren myself, and will keep the date as I know it, even though I now know that it’s safe to pick and eat them for another ten days. Although in my experience they’re usually past their pick-by date by now anyway, being a bit blown or mouldy or even maggoty. 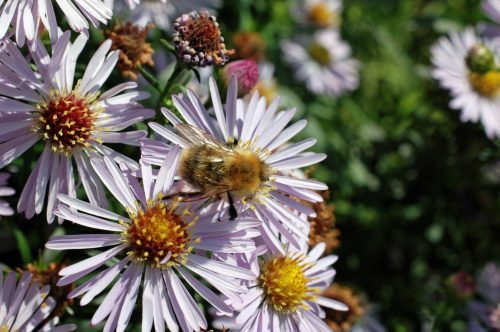 Late summer and early autumn wouldn’t be the same without Michaelmas Daisies. Ours have been flowering in the garden for a few weeks now and as always at this time of year are doing a brilliant job of supplying pollen and nectar to a range of insects still out seeking it. 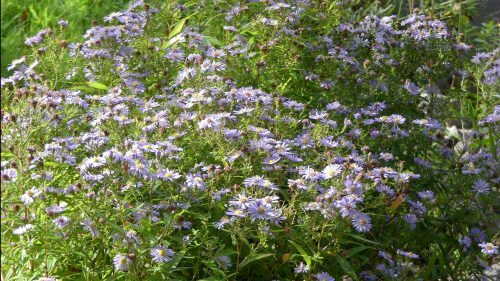 Michaelmas daisies were first introduced into Britain from North America around the beginning of the eighteenth century. The Victorian’s love of wilder gardens encouraged their wider planting and from there they escaped into the wild, becoming naturalised in an array of habitats. 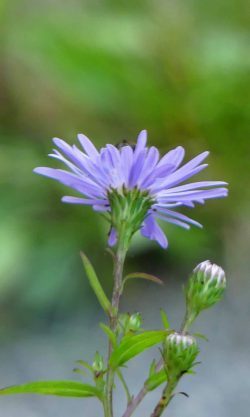 In the language of flowers, the Michaelmas-daisy symbolizes a farewell or a departure.The act of giving a Michaelmas Daisy symbolises saying farewell, perhaps as Michaelmas Day is seen to say farewell to the productive year. If the breast bones of the goose are brown after roasting the following winter should be mild, but if the bones are white or have a slight blue hue then the winter will be severe. The Victorians believed that trees planted on this day would grow especially well. Michaelmas used to be a popular day for the winter night curfew to begin – the first hint that winter was on the way. Curfew took the form of a tolling of the church bell, usually one strike for each of the days of the month that had passed in the current year and was generally rung at 9pm. I don’t know if you are interested. Thank you Suzanne, it does look interesting, will investigate further! It’s funny how superstitious we can be isn’t it? I learnt that about blackberries as a child and wouldn’t dream of not abiding by it! Not worth the risk! Never knew this about blackberries! I will be cautious from now on. Thank you Jaqueline, go for it – roast goose can be amazing if you get it right, and why wait till Christmas?! It’s good to be reminded of these ancient customs and folklores, but at the same time it’s a shame that many are not practiced as they used to be. I agree absolutely Denzil. These old traditions are a part of our culture and heritage and we are poorer for their loss I feel. If for no other reason, remembering them could give us another day of celebration and pause to be thankful for what we have and too often take for granted – our version of Thanksgiving Day with goose rather than turkey? Thank you Suzanne, I enjoyed researching it and reminding myself of the significance the day had in our social history really not so long ago. Lovely post and wonderful impressions! Thank you for your interest, I’m happy you enjoyed the post. Hello Theresa. Lovely to se you explaining about what Harvest Festival means, so many will hear about different Saints but not know who they were. Lovely photo`s and storyline. On Saint Michaelmas Day. Paula. Thank you Paula, Harvest Festival was one of the highlights of the school year for us growing up and I think it’s one of the things that kept us connected to the realities of our environment. We didn’t get treated to goose though! I think you might be OK till October 10th! 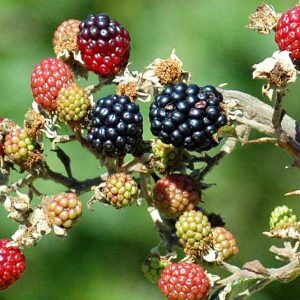 Besides the superstitions, some brambles still had flowers up until recently, so their fruit is bound to be later isn’t it? Maybe resist eating them raw as you pick them! I was hoping to pick a few more blackberries yet but perhaps I shouldn’t!